The Fastaction Fold Duo Click Connect is a solid stroller for city dwellers and frequent fliers who have multiples or two young children. It has many features that make it attractive to parents who want to travel with their children from birth and beyond. Integrated infant seat clips leave guessing games out of the infant traveling game, because they fit all Graco car seats and don’t disconnect, so you’ll never lose them in transit. The Fastaction is large for its category, which may be a deal breaker for some however, its size makes it sturdier and able to accommodate children up to 50-pounds. Its Fastaction Duo Click closure system makes folding and unfolding the stroller a cinch - which is just what busy parents of two want to hear. 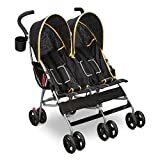 For busy parents of multiples looking for inexpensive strollers that grow with baby, lasting from birth and beyond, the Fastaction Fold Duo Click Connect is an ideal choice. The Graco Fastaction Fold Duo Click Connect stroller is the answer to the prayers of moms of multiples everywhere. This innovative stroller combines many popular design features to make travel with little ones a breeze. Whether you have young twins or two under two, the Fastaction is a great stroller that grows with baby, fits into your busy lifestyle and overly full hands. Featuring a tandem style seating arrangement, the Fastaction series are double strollers that grow with baby, accommodating two riders up to 50-pounds in size each, meaning that babies to small elementary schoolers can enjoy cruising along during day trips or errands. Children can ride from birth and beyond with integrated connection points for infant seats in each seat. This means that you can accommodate twins from birth in tandem car seats. As babies grow, they move to the traditional seats that are buckled with 3- or 5-point harnesses, depending on child size. Each seat is fully customizable to the child riding in it. Seats recline individually to suit babies of different ages, even those who cannot themselves yet sit upright. This feature also comes in handy at naptime, when one rider needs a recline while the other is wide awake. Seats recline almost flat with the push of a button to make the transition to naptime that much easier. Each seat also comes equipped with its own weather shield to keep little ones protected from the sun’s rays or the surprise rain storm. Separate shields keep fights from breaking out between the sibling who wants shade and a little sun lover. Additionally, each shield features a peek-a-boo window for parents to observe kids while pushing the stroller to help ensure safety and comfort during the ride. The Fastaction is a compact tandem stroller that is easy to navigate through crowds and city streets. It features a nimble, yet durable construction that helps you to cut through sidewalks and store aisles without a hitch. Though the Fastaction is certainly not the most lightweight stroller on the market, – a downside for some parents – it’s agile enough to compete with some of the more high-quality precision-engineered strollers in its category. A narrow depth makes the Fastaction an ideal travel companion for cafe runs, though it does not meet the 2×4 requirement for public transportation, making city transport a bit complicated with two kids and all their gear. Because of this, the Fastaction needs to be folded for transport on buses and subway systems. The Fastaction Fold Duo Click Connect gets its name from the superior fold technology that it contains. Unfolding the stroller takes only a second and the push of a button – a great feature for parents of multiples who have only one hand free at a time. Folding the stroller, too, is simple, with pull strap operation located underneath fabric flaps in each of the rider seats. Care must be taken however, during folding to keep the stroller from accidentally bumping into your shins. The Fastaction is not designed to stand alone, so the folding action can cause it to move forward during closing and into the person who is closing it. The Fastaction comes equipped with the accessories you’d expect from a stroller you want to use on a regular or daily basis. Included are cup holders and a tray for parents to store cell phones, water bottles, and more during their outings. Children, too, have attached cup holders to accommodate sippy cups and water bottles during a day out. The riders’ cup holders can be adjusted and/or removed depending on what riders and parents desire. The Fastaction also has roomy gear storage beneath the rider seats. Each seat is perched atop a mesh basket that is accessible from the back and sides, making it simple to insert larger items from multiple angles. The baskets are separate, with a divider in the middle, which may make it a bit challenging to maneuver the larger items into place however, the division does make basket organization easier. The Fastaction has four plastic wheels to keep it running smoothly along sidewalks or indoor surfaces. The wheels, while safe and functional on smooth terrain, are not designed for any type of off-road experience or athletic endeavors, as a jogging stroller might be. Available in “Fern”, an attractive black coloring with green details, the Fastaction works well for children of both genders and multiple ages. It certainly couldn’t be considered “girly” or “all boy”, making it a winner for families with children of both sexes. It coordinates well with other Graco products, including car seats, to maintain a consistent look and feel when used with these items. One of the best features of the Fastaction is that it can grow with your children from birth through late toddlerhood. The Fastaction’s generous weight range and infant seat connectors make it a great fit for babies and toddler along a wide range of sizes. 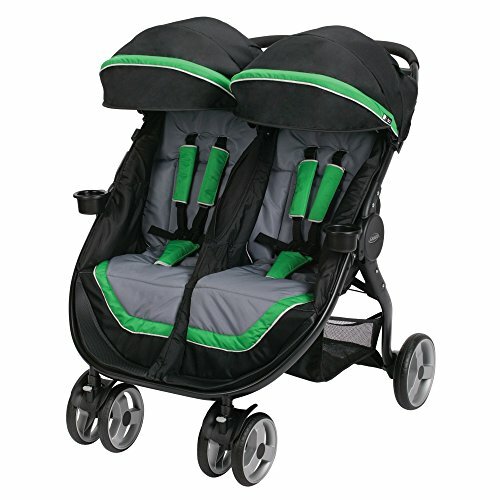 Not only is the Fastaction ideal for twins, but it is a good choice for parents of two small children who both need to ride during family outings and travel. Individually reclining seats and a generous weight range make this a good fit for growing families. 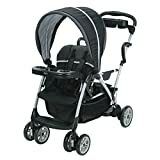 Q: Can I connect an infant car seat in this stroller? A: Yes, infant car seat adaptors are available in both stroller seats. The Fastaction can accommodate up to two car seats at a time, or one car seat and a seated child. Q: Does this stroller handle multiple terrains well? A: No, the Fastaction is intended for use on even, smooth surfaces. It is not equipped with rugged multi-terrain tires or shocks of any type. It is best used in city sidewalk and indoor settings. Q: Can two children of different sizes ride comfortably? A: Yes, the Fastaction’s two seats allow for a variety of customization for multiple riders. A toddler and a baby can ride comfortably, with the baby reclined and toddler upright. Additionally, included sun shades and cup holders give each rider age-appropriate customization for their ride. Q: What is the weight limit for each rider? A: Each seat is designed to hold a rider up to 50-pounds in weight. This can be helpful for parents of two differently aged children, as one will almost certainly be heavier than the other. It is also helpful for parents of twins who are looking to get the most use out of their stroller, as it truly accommodates children from birth through late toddlerhood, and even into the elementary years, depending on each child’s unique size. Q: What are some good alternatives? A: If you are a fan of Graco double strollers, do have a look at our Baby Jogger 2016 Summit X3 Double Jogging Stroller Review. The Baby Jogger brand was acquired by Graco in 2014. The Fastaction is large for its category, which may be a deal breaker for some however, its size makes it sturdier and able to accommodate children up to 50-pounds. Its Fastaction Duo Click closure system makes folding and unfolding the stroller a cinch – which is just what busy parents of two want to hear.